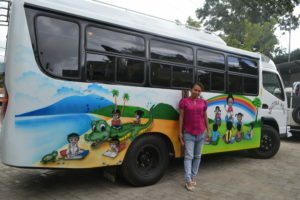 Many challenges remain in order for children in Timor-Leste to have access to quality education. These challenges include high rates of school drop-outs; absenteeism; geographic disparities in access; lack of educational resources; and limited educational opportunities for vulnerable groups of children. Furthermore, teachers continue to engage in rote learning and are not trained to approach the curriculum with creativity and innovation, and are therefore unable to effectively engage children in the classroom. In response to these challenges, Mary MacKillop Today’s Mobile Learning Centre will give the poorest and most neglected children the opportunity to access books and educational facilities through the provision of a library learning centre and interactive workshops, encouraging children to develop a passion for education and creatively engage in key learning areas. Regular visits to schools/orphanages to conduct children’s ‘edu-tainment’ activities including using music as a tool for teaching literacy and numeracy, drama, craft activities and group reading. Conduct inclusive education activities with children with disability or affected by trauma. Mentor teachers to be able to apply creative and fun activities in the classroom including puppet shows, music and reading activities. Provide schools and orphanages with Tetum story books and other educational resources to borrow and to keep. Visit nearly 5000 students in pre-primary and primary schools generating excitement around education and allowing children to develop a passion for learning. Allow 300 teachers to borrow books and other learning materials. Ensure over 50 children with a disability have the opportunity to engage in inclusive learning activities. Provide a creative outlet for children affected by trauma and poverty to express themselves and explore their feelings, through activities such as music and drama. Act: Ask your school to become involved in Mary MacKillop Today by contacting our Global Education Officer for ideas, at [email protected] or call (02) 8912 2777.